THEY hear the whispers, these Bulldogs do: They could dominate the league. They might be the best team in school history. This could be the year Kaimuki wins its first state title since 1993. They behave best, as dogs often do, as a pack. "We don't really talk about it," guard Daniel Colon said of the defending Oahu Interscholastic Association champions. "We all get along. We hang out in school and outside of school." But they hear other whispers, too, the silent ones that don't come from coaches or fans. Those words resound within, the ones that cause any dog to go astray. Ease up. Don't run so hard. Cruise. It's only preseason. Heck, even Sports Illustrated elevated Kaimuki to top-dog status, naming the team as the best in Hawaii. The whispers can be unproductive. "The kids are winning, so they get complacent," coach Kelly Grant said of their 6-0 start in nonconference play. "Last year, our practices were extremely good." When Grant arrived on campus three years ago, the former Maryknoll and HPU player was relatively unknown to his new team. He had a pack of 'Dogs that were motivated and had leadership within its ranks. Right now, they miss former leaders Jarett Shiu and Shaun Dela Cazada. "Shaun and Jarett made sure we wouldn't have a bad practice. Some of our players don't know how to practice hard. They were so used to following the lead of the seniors last year," Grant said, referring to All-State candidates Beau Albrechtson, Keone Reyes and Colon. "Beau and Daniel, they're the type to lead by example. Keone needs to realize that he needs to work hard," Grant said of the two-sport standout. Reyes, at 5-foot-11, 255 pounds, was recently named the Oahu Interscholastic Association White Conference defensive player of the year. "It's gotta come around pretty soon," Grant cautioned. The Bulldogs face Hilltop (San Diego, Calif.) tomorrow at the Hilo High School/Big Island Candies Tournament. "In seven days, we play one of the top teams in the country," the coach added. That would be Roman Catholic (Penn.) at the Iolani Classic. "They think they can win," Grant said, noting that Colon, Albrechtson and Reyes played on a summer team that won three games at the Main Event tournament in Las Vegas. That, of course, was a different scenario, a team of All-Stars. This Kaimuki squad has a young bench. There is a need for a sense of urgency. Complete alertness. The 'Dog Whisperer' of TV fame knows this well. Cesar Millan always says that every dog, every pack needs exercise, discipline and then, affection. But even Millan says he works with dogs, but trains people. What do you do when the 'Dogs are people? "I think our team's too confident with the magazine saying we're No. 1," team captain Bryan Lim said. "We feel good, but we're big-headed. I think we need to lose a game to realize we're not good enough yet. Honestly, I don't think we're gonna win states if we don't shape up." THEY LOOK GOOD. They play good. Casual observers may assume that Kaimuki is on a big roll. Up close, though, it is clear that Kalaheo is deeper, bigger and moves the ball more crisply. Punahou's new starters have embraced their roles, second-year players who are quickly developing into potential All-State candidates to complement their two Star-Bulletin Fab 15 standouts. Iolani? There is never a bare cupboard there, not after five straight state championships. In a win over Farrington last week, Kaimuki's two key post players, 6-foot-4 Albrechtson and Reyes, combined for eight points, seven rebounds and six turnovers. The Bulldogs shot 44 percent from the field, committed 20 turnovers and won by 31 points. Two days later, Colon had just eight points, but Albrechtson had 22 points and 11 rebounds as Kaimuki edged University High for the Puma Black and Gold Tournament title. The common thread in their victories was defense. Farrington shot 22 percent from the floor. UHS shot below 35 percent against a relentless Bulldog man-to-man defense. "Coach stresses defense a lot. If you play defense, the offense will come," said Colon, who uses his quickness and long arms to make a lot of momentum-changing plays in the passing lanes. Last year, in the OIA playoffs, Kaimuki came up with a way to slow down Kahuku's one-man scoring machine, Okesene Ale Jr. He finished with 12 points, a season low, and Kaimuki won its first OIA crown since 1993. "He's a good coach. He's smart. Knows the game," Colon said. Kaimuki's top three players have a history together that goes back several years. "Beau and Keone played at Boys and Girls Club. We played each other and the games were always intense. His teams always won," Colon recalled. "(Keone's) big and he uses his body well. When we all got to high school, they played for us. Beau grew a lot. He always had his reverse layup, but he improved on his dribbling." EVERY LACKADAISICAL CONTENDER becomes a pretender. That's why the Bulldogs -- or as Colon says, "Underdogs" -- are running laps on a Monday afternoon -- on the track -- instead of practicing. "A lot of people fool around too much," Lim said. "Somebody has to take the lead, but I don't think anybody can. Maybe Keone, if he steps up." For Grant, the wins and losses mean nothing right now. He and his staff watch carefully. The speedsters. The plodders. It goes on and on until Grant is relatively satisfied, if you can call it that. They gather and Grant sends them home. It's not personal. He challenges his players, each of them, to reach higher. It's ingrained in his DNA, something that was passed down a long time ago by a balding genius named Tony Sellitto. Like many of his players, Grant's star began to shine while he played at Boys and Girls Club. Grant began to flourish under Dwight Sato and other coaches, and within a year, a small-school basketball power took notice. Even before Grant went from Washington Intermediate to Maryknoll, he began to grasp the meaning of expectation. Sellitto, who built tiny Maryknoll into a state basketball powerhouse, didn't accept academic patsies onto the Spartan campus. "(Sellitto) told me if I didn't get a 3.0 (grade-point average) at Washington (Intermediate), I couldn't get into Maryknoll," Grant recalled. For the hoopsters who made the grade, Maryknoll was basketball nirvana. Sellitto was well known for testing the mettle and year-round commitment of each student-athlete. You either loved the game or you didn't. There was no gray area, no babysitting allowed. "I think I needed structure," said Grant, whose parents divorced while he was young. "Even though my dad was around, my mom had to work long hours. Sellitto was my father figure." Maryknoll won its only state title in boys basketball in 1984. "The team I played on was lots more talented," Grant said, comparing the '84 Spartans and current Bulldogs. "Kui (Ostrowski) was our Keone. Tony Turner could run the floor like Beau. Mike (Among) was our floor leader. So was Ben (Valle). And we had Kui's brother, Dominic." "The one thing I did appreciate is that they allowed me to go to school there and improve my academics," Grant said. "Sellitto allowed us to have those opportunities." Still, Grant likes the direction Kaimuki is heading in. 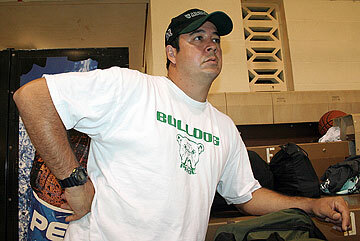 "Kaimuki is making more state tournaments (in other sports). They have quality coaches and they're building a great program," he said. THE BIGGER PICTURE never escapes Grant, though it sometimes is out of the grasp of high school athletes. If Grant is right about complacency, Colon wants to reverse the trend. "It's different now. Last year, we were ahead at this point. We had to prove people wrong. I'm used to being the underdog. We still play like it." The hunger, though, is missing. "Last year, everything was intense. Jarett, especially, he'd get on us," Colon said. "In games, I can motivate 'em, but in practice, the intensity isn't there." The laid-back senior would do one thing for sure if he were this team's coach. "I'd make us run more." So would Grant. Any letting up for the Underdogs is unacceptable because, with or without an endorsement from Sports Illustrated, Grant knows this team could go one step farther than last year's team. He has a yellow alert out, but the emergency horns aren't blaring. Maybe the 'Dogs will listen.